An Uncomplicated Life Blog: 5 Ways To #LiveBrighter With Kids to Reduce Energy Consumption! 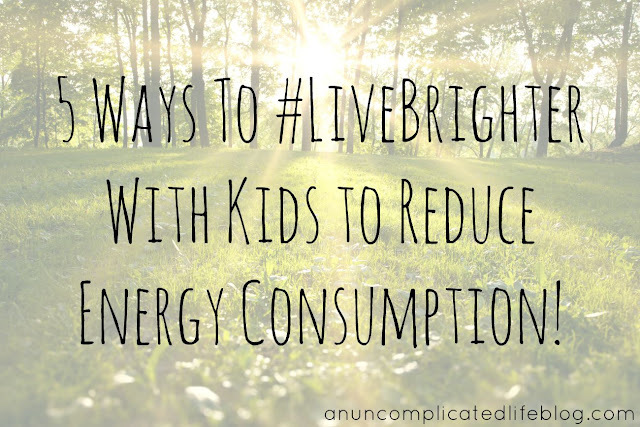 5 Ways To #LiveBrighter With Kids to Reduce Energy Consumption! It's officially the dog days of summer, and that means everyday here in Texas is over 100. While AC keeps us safe (and sane!) it does a number on your wallet and stresses "the grid" to the max. I'm not big into promoting corporate America or big utilities, but Direct Energy (for both U.S and Canadian consumers!) wanted to partner with bloggers to spread the word on how we can get folks to USE LESS OF THEIR PRODUCT. That's right, an energy company that wants you to buy less of what they sell. Ok, this is something I can support! 1) Dress cooler: While I can't set the thermostat to 80 degrees during the day because H and I are home, I can raise it. Adjusting your usage by even a few degrees can have huge effects on your monthly bill! Our daily setting is 74. To accommodate the warmer temp, Henry and I are in tank tops, shorts and bare feet. I've gotten so used to the warmer indoor temperature, I freeze my bum off when we go to a mall or a movie theater! 4) Stay hydrated: This is a no-brainer, right? But when your body is hydrated, it's easier for it to maintain homeostasis. When your body has to work less to stay healthy and in normal, working condition, you don't need to crank up that AC as much! Make sure your little one is also drinking tons of WATER (juice isn't necessary and is nearly all sugar. Stick to water!) by providing constant easy access to it. I give Henry a sippy and leave it in our playroom for him to grab as needed, and pack it along when we leave the house. How do you manage your energy consumption? Do you find yourself making an effort to consume less, and teach your children to live greener? I'd love to hear your tips! We definitely can use these tips here in Florida, too! When we started house hunting, we knew it was important to get a house with a newer AC that is more energy efficient. New windows and doors help, too! And having a big shade tree would be a huge plus as well. Oh yeah girl. Unfortunately Direct Energy isn't available in my city. Bummer. I love that they want consumers to use less--that's something I can get behind, too. We try to keep our A/C at 75 during the day, but lately we've been trying to hang out in the room that stays coolest (our dining room) and set it to 76 instead. We use our fans to keep cool, too. It costs about a dollar a month to run a ceiling fan nonstop. Sign me up. Since I'm at work all day, my AC isn't running. My house is always around 74 degrees. I'm in the back of the building surround by trees, so my house never gets too hot. We try really hard to be more energy efficient. Staying hydrated is so important. I'm always drinking iced water. Holy cow that is a huge electricity bill! Even in Colorado during the drought and days over 100 my bill has never gone over $175. Great job finding alternative ways to stay cool! wow, that's awesome that they want you to use less of their product. we keep the AC pretty high during the day, even when KC is home during the summer. We keep it lower overnight because he can't sleep if he's too hot. Honestly, I'd be fine if AC didn't exist, ever again. I like the heat. I know, I know, I crazy. I hate hate hate hate the cold though, so the heater is my life blood lol. We just got our July electric bill and ouch… I’m all about wearing cooler clothes so we don’t crank the AC on full blast all day. I love these ideas! We use average billing and it's a life saver. I want to kiss the people who owned our house before us because they invested in UV blocking solar screens for most of the windows and they super insulated the attic. Before we lived in a weatherproofed home, our A/C bill was ridiculous. All those little things make such a big difference. We definitely could use these tips in our Texas heat! It's been 100+ for several weeks now! I hang laundry out to dry in the summer - it's so hot it seems crazy not to!